'Genius' Cosmopolitan 'The best book I have read recently ...Absolutely blinding. Read it. Do it.' 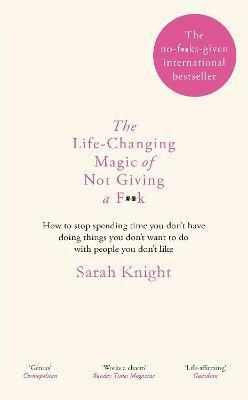 Daily Mail The bestselling book everyone is talking about - our favourite anti-guru Sarah Knight reveals the surprising art of caring less and getting more. Are you stressed out, overbooked and underwhelmed by life? Fed up with pleasing everyone else before you please yourself? Then it's time to stop giving a f**k. This irreverent and practical book explains how to rid yourself of unwanted obligations, shame, and guilt - and give your f**ks instead to people and things that make you happy. From family dramas to having a bikini body, the simple 'NotSorry Method' for mental decluttering will help you unleash the power of not giving a f**k and will free you to spend your time, energy and money on the things that really matter. The Life-Changing Magic of Not Giving a F**k: How to stop spending time you don't have with people you don't like doing things you don't want to do. 'Self-help with an edge' Vogue 'I love Knight's book before I even start reading it' Sunday Times Magazine Coming this December from our favourite anti-guru Sarah Knight: Get Your Sh*t Together - the must-have follow up and perfect companion to bestselling The Life-Changing Magic of Not Giving a F**k.